You can banish this card from your Graveyard, then target 1 Continuous Spell/Trap Card in your Graveyard; add it to your hand. You can only use this effect of this card's name once per turn. Once per turn: You discard 1 "Wingkeeper" card; apply this effect, depending on the type of card sent. ● Spell Card: Add 1 "Wingkeeper" Continuous Trap Card from your Deck to your hand. ● Trap Card: Add 1 "Wingkeeper" Continuous Spell Card from your Deck to your hand. ● Monster Card: Draw 1 card. If you control a face-up "Wingkeeper" Spell/Trap Card: You can Special Summon this card from your Graveyard. When this card is Summoned: You can target 1 monster you control; return it to the hand, and if you do, add 1 "Wingkeeper" monster from your Deck to your hand, but you cannot Special Summon monsters for the rest of the turn, except for "Wingkeeper" monsters. You can only use each effect of this card's name once per turn. 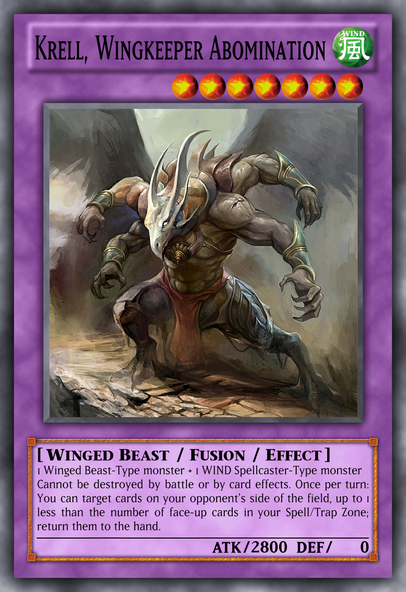 ● Once per turn: You can Fusion Summon 1 Winged Beast-Type Fusion Monster from your Extra Deck, using monsters in your hand as Fusion Materials. You can only use each effect of this card's name once per turn. If you activate a Continuous Spell/Trap card: You can Special Summon this card from your hand. You can only use this effect of this card's name once per turn. During either player's turn: You can return this card to the hand, then target 1 face-up Spell/Trap card you control: Return it to the hand, then apply this effect, depending on whose turn it is. 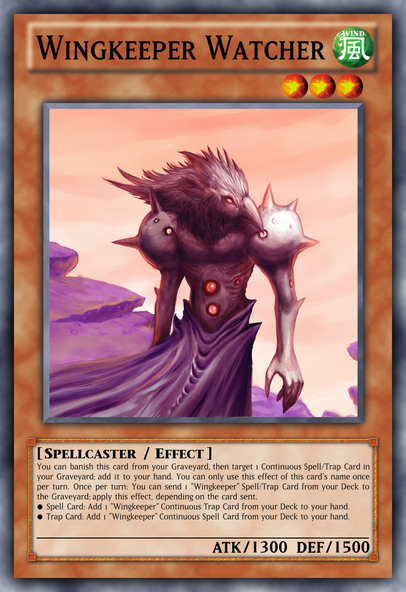 ● Your turn: Set 1 "Wingkeeper" Continuous Trap Card from your Deck. 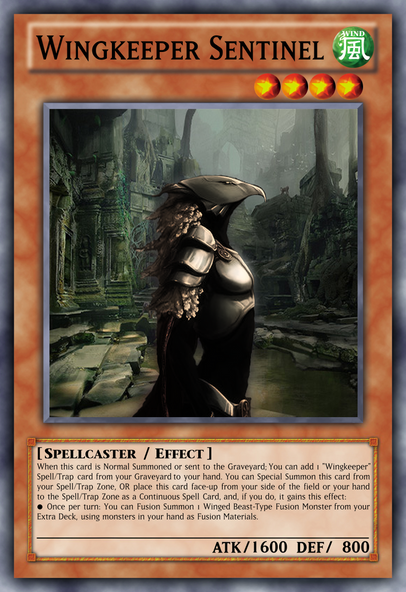 ● Your opponent's turn: Set 1 "Wingkeeper" Continuous Spell Card from your Deck. 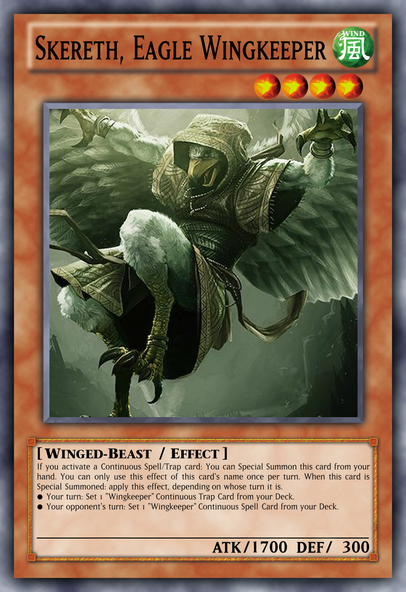 If you control a "Wingkeeper" monster: You can Special Summon this card from your hand. You can only Special Summon "Zruka, Falcon Wingkeeper" once per turn this way. Once per turn: You can discard 1 "Wingkeeper" card, then target 1 card your opponent controls; destroy it. During either player's turn: You can target 1 face-up Spell/Trap Card you control; return it the hand, and if you do, return this card to the hand. You can only this effect of this card's name once per turn. When an opponent's monster targets a "Wingkeeper" monster you control for an attack: You can Special Summon this card from your hand, and, if you do, end the Battle Phase. When this card is returned from the field or Graveyard to the hand: You can target 1 face-up card you control; return it to the hand, and if you do, gain 500 LP for each card in your hand. Once per turn: You can target 1 "Wingkeeper" monster in your Graveyard; add it to your hand. You can send 1 monster you control to the Graveyard, then target 1 WIND Fusion Monster in your Graveyard; Special Summon it in face-up Attack Position. You can only use this effect of this card's name once per turn. While you control a "Wingkeeper" monster, you have no maximum hand size. 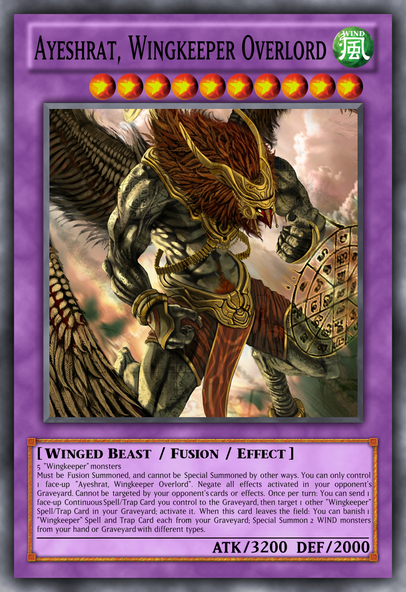 Once per turn: You can Fusion Summon 1 "Wingkeeper" Fusion Monster from your Extra Deck, using monsters you control or in your hand as Fusion Materials. 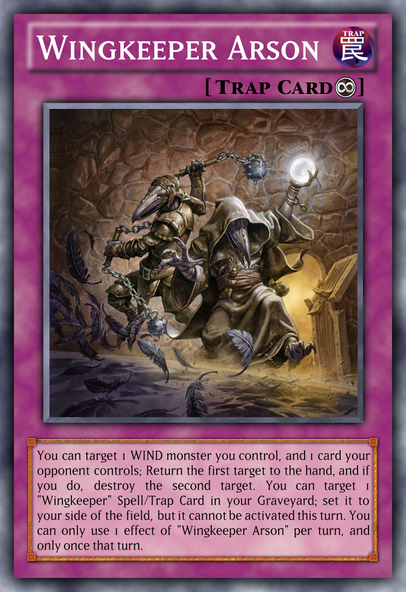 During each of your End Phases: You can send 1 WIND monster from your Deck to your Graveyard, then target 1 other "Wingkeeper" monster in your Graveyard, except a Fusion Monster; Special Summon it. You can only use this effect of this card's name once per turn. All face-up WIND monsters you control gain 1000 ATK and DEF. Once per turn: You can target 1 face-up "Wingkeeper" monster you control; return it to your hand, and if you do, you can Special Summon 1 card with that card's name from your hand during the End Phase of this turn. You can target 1 WIND monster you control, and 1 card your opponent controls; return the first target to the hand, and if you do, destroy the second target, also both players take 1000 damage. You can target 1 "Wingkeeper" Spell/Trap Card in your Graveyard; set it to your side of the field, but it cannot be activated this turn. You can only use 1 effect of "Wingkeeper Arson" per turn, and only once that turn. Cannot be destroyed by battle. Once per turn: You can target cards on your opponent's side of the field, up to 1 less than the number of face-up cards in your Spell/Trap Zone; return them to the hand. 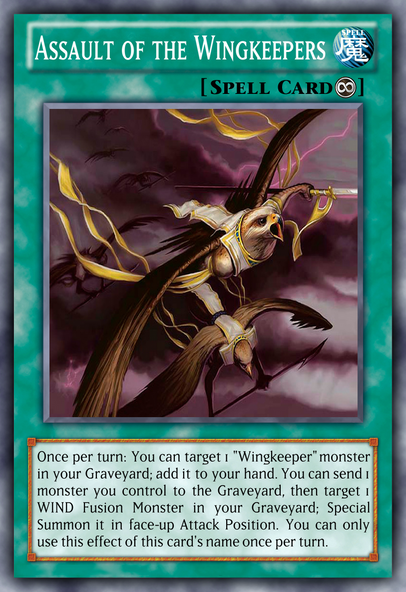 When this card leaves the field: You can send 1 "Wingkeeper" monster you control to the Graveyard; Set 1 "Wingkeeper" Spell/Trap from your Graveyard to your side of the field, but it cannot be activated this turn. Cannot be destroyed by battle or by card effects. 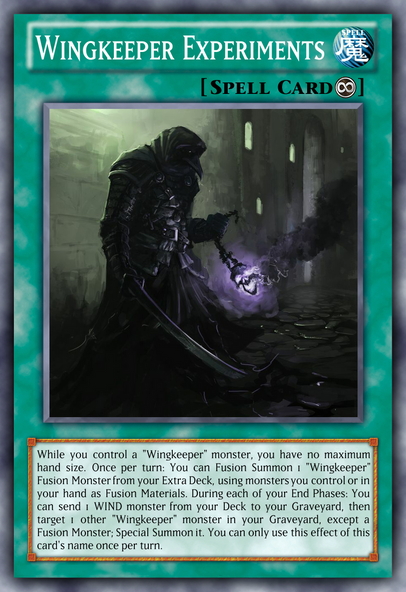 When a "Wingkeeper" monster you control attacks or is attacked, your opponent cannot activate cards or effects until the end of the Damage Step. 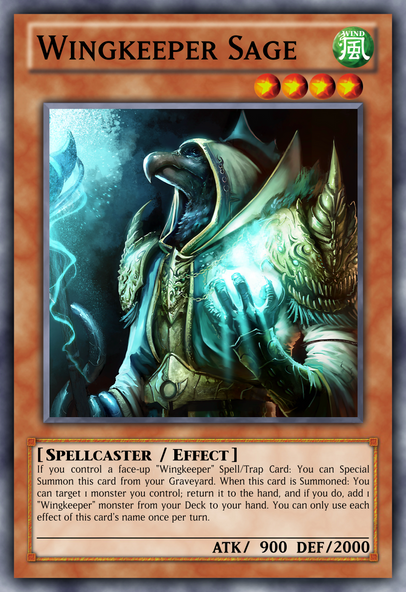 When this card leaves the field: You can discard 1 card; Special Summon 1 Winged Beast-Type monster from your hand or if you do, send 1 Spellcaster-Type monster from your Deck to the Graveyard. Must be Fusion Summoned, and cannot be Special Summoned by other ways. You can only control 1 face-up "Ayeshrat, Wingkeeper Overlord". Negate all effects activated in your opponent's Graveyard. Cannot be targeted by your opponent's cards or effects. Once per turn, during either player's turn: You can send 1 face-up Continuous Spell/Trap Card you control to the Graveyard, then target 1 other "Wingkeeper" Spell/Trap Card in your Graveyard; activate it. 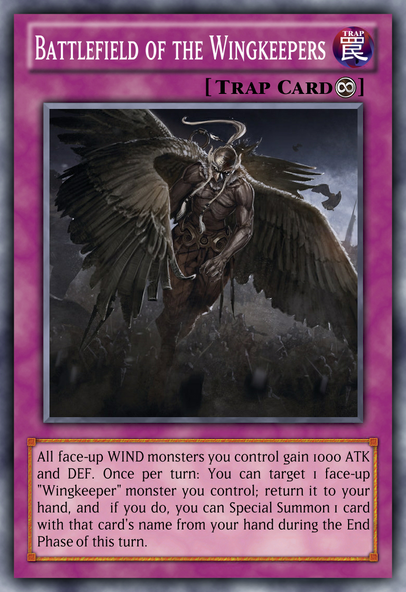 When this card leaves the field: You can banish 1 "Wingkeeper" Spell and Trap Card each from your Graveyard; Special Summon 2 WIND monsters from your hand or Graveyard with different types. Archetype of WIND Spellcaster and Winged Beast-Type monsters. They rely a lot on their Continuous Spell/Trap Cards. However, they are capable of adding and recovering them. A lot of them vary in Level, and their Extra Deck Monster(s) Fusion monsters. Each Fusion monster has an effect that triggers upon leaving the field; that effect can vary from activating a Wingkeeper Spell/Trap Card to Special Summoning one. Decided to add a theme of returning themselves to hand for the Winged Beast, like birds, and more Graveyard-centered play for the grounded basic Spellcasters. Tried to make it rather open, but worried that some combinations with WIND and Winged Beasts might be a bit much (Thinking of Battlefield's generic boost and Assaults generic add), and am unsure whether it is really necessary. Particularly concerned with the synergy with Majespecters, but it seeeeeeems fine for now. Might update this in the future, but I think this is fine for now. Hope you enjoy! CnC would be nice, especially if there really is a broken interaction with Majespecters and the like. Proud member of the Archetype Generator Meta! Go check it out in the clubs section for a veritable goldmine of archetypes! Wire Snake: With Cyberse comes Viruses! Venom Support: Starving Venom and Snake Deity! Silent One: Bringing balance through Tokens! Wingkeepers: WIND Fusions with Continuous Spells/Traps! Yollohcoatl: Field Spell triggered swapping Trapmons! Slight update on Arson and Sentinel. Alrighty, I'll take a look at this since I haven't reviewed anything in a while. Let's do this!!! Wingkeeper Watcher: A great recovery effect for the archetype that nabs your Spells/Traps from the grave. However, it has an added on Foolish Burial esque effect, alongside a search effect that nets you pretty much a +1. Essentially, this and an actual Foolish Burial will let you get two of your Spell/Trap Cards of your choice. I only wished that it made you send 1 from your hand instead to make it a trade off. The stats aren't anything special though but that all the more makes it fodder to your Fusion Monsters. Wingkeeper Sage: It has its own Summon effect built in which is nice. And then it gets a free bounce on your own card and adds a "Wingkeeper" monster. I do like the self-bounce, and the Deck thinning of this, but perhaps give it a drawback, such as you can't activate or Summon the returned card or so. Otherwise, it gives the monsters searching power and increases its speed (which seems necessary in almost every Deck). 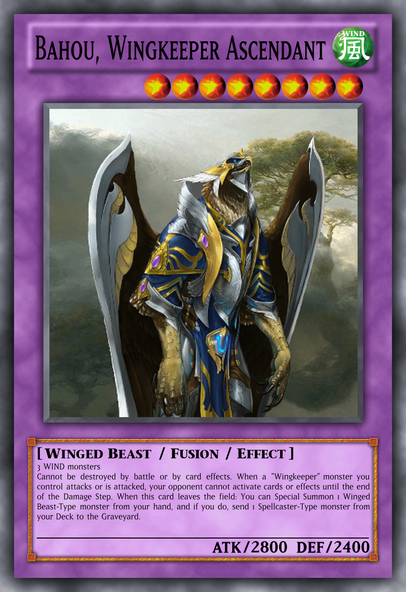 Wingkeeper Sentinel: It is an intriguing card as it can place itself in the Spell/Trap Card Zone to make your fusions. However, you may have forgotten a OPT clause and by that, right now it seems as if you can Special Summon it and then place it back and redo the Fusion Summon effect. The recovery effect seems to be a mid game Watcher but isn't at the same time. I feel like I would run this more than Watcher. Wingkeeper Skereth: I like this as it gives player interaction in a way as it allows the player to disrupt your play with this card. I do feel though that this is kind of mean to just activate a "Wingkeeper" Spell/Trap Card and then throw this out on the field to get another "Wingkeeper" Spell/Trap Card. Maybe make it if the card was destroyed instead, so that it only replaces the Spell/Trap Card with another instead of merely giving a plus. Wingkeeper Zruka: It does too much for a Main Deck monster that can Special Summon itself from the hand. It has a balanced destruction effect, but it seems to be able to recycle itself and a card to the hand! I am unsure on whether to mark it as a bit overpowered or not. 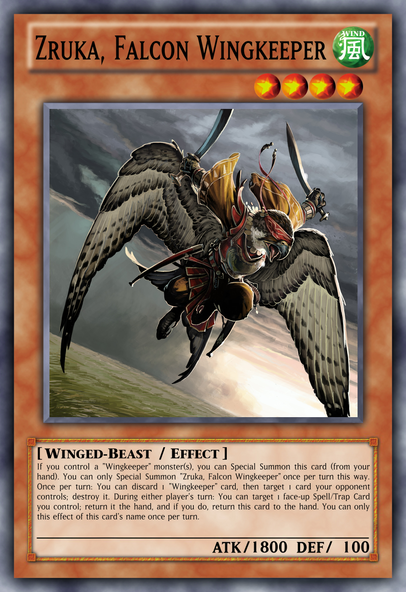 Wingkeeper Isa: It has a Speed 2 version of Negate Attack + Self-Special Summon, and it has a your-sided Compulsory Evacuation Device + Neo-Spacian Hummingbird LP recovery effect. Furthermore, it can recover itself from the Graveyard..., I would take off 1 of these effects as it has too much going on here. 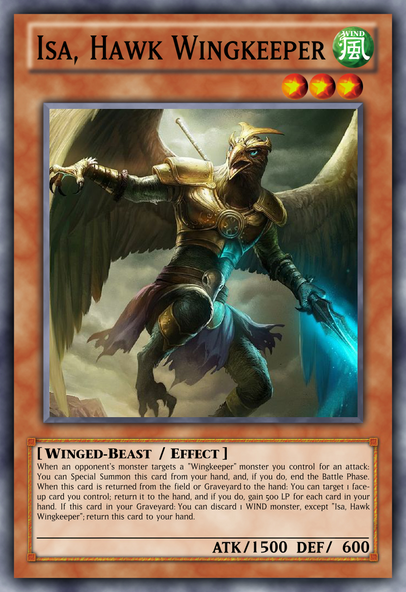 Assault: If this card can recover your Wingkeepers from the Graveyard without a cost, I see it that the monsters themselves do not require such effect like this. If you do that, it pushes the player to use the Spell/Trap Cards to recover their monsters. The only real thing going for this card is the Special Summon effect, which revives 1 of your dead Wingkeeper Fusions. Otherwise this card is overshadowed by your other cards. Experiments: The unlimited hand size limit effect allows you to extend your plays without worrying about discarding at the End Phase for having to many cards in your hand. It has a continuous "Wingkeeper" personalized Polymerization for it which isn't much. Then it has the effect to revive a non-Fusion "Wingkeeper" from your Graveyard at the cost of sending a "Wingkeeper" monster from your Deck to the Graveyard, if that is even a cost. The last effect is basically a self running free Special Summon as long as this card is face-up. Battlefield: The stat boost is quite large for a Continuous Trap. With 3 of these, that would give a 3000 ATK and DEF boost, which is quite a lot when you think about a Level 4 Wingkeeper becoming a 2800 beater or perhaps even a 4800 beater. It has a return effect that allows a delay Special Summon at the End Phase. It is good that this part is slow, but at the same time, it allows you to play cards and then in the end add that card back and Special Summon it once again. Arson: Despite its name, I see no random burn effect anywhere. In the end, it can allow you to reuse a "Wingkeeper" monster later as it returns to the hand, and get rid of annoyances on the opponent's field. You can also set your Spell/Trap Cards from the Graveyard but it can't be activated that same turn. In all, this card seems balanced since only 1 of the effects can be used. Both are great to make your plays wider and is also balanced by the fact it is a Continuous Spell/Trap Card. Woooo, time for the Extra Deck!! Wingkeeper Krell: It has a built in protection from battle and card effect. This is an easier to Summon Beelze with a stronger bounce than that of Castel. More than just overpowered, it has bouncing and protection with nice stats for a Level 7 that can enter the Rank 7 Xyz territory if wanted. Bahou: Built in protection just like Krell. Slightly more difficult but has more generic materials needed instead of more specific materials. It doesn't allow the opponent to respond to your attacks with any card effects. It also has a more specific float effect that Foolish Burials a Spellcaster. I would say this card is fine, if its float effect was less heavy on the opponent. They do have to work to bypass the battle and card effect protection after all. Ayeshrat: A more archetype based summoning condition which balances this out a bit. It also forces you to throw your pluses away so you can get the boss out too which is fair. It is a floodgate for Graveyard, and allows you to replace unneeded Wingkeeper Spell/Trap Cards from your Graveyard which is great when you're in a sticky situation. That's the problem, I feel this card should be allowed to activate it during either player's turn. Its float effect seems to be more balanced than the other Fusion Bahou. Was this intentional? It makes me feel like wouldn't want to play this when Bahou and Krell are already overwhelming the opponent than this. The only real plus side to this card is that it plays floodgate. The other Fusions are basically better options that take less to make and are worth it more than this boss monster and that is a tragedy. All in all, the archetype has a big focus to swarm and recycle by returning to the hand. But it lacks variety in a way and the Fusions seem to lack sight of balance when the lower cost Fusion seems to overpower the boss. At some point, this may even be played as a Rank 4 Spam Deck instead of its actual focus of Fusion. I'd give this a 7.4/10. Gonna put my own notes here, to remember what to change. A cost is probably better, yeah. I find preventing activation and Summoning from the hand a bit clunky, so perhaps I will limit the condition a bit more, instead. My hope is to run all of this at the same time. Yes, HOPT is meant to be placed on all effects. Does that bring it closer to all Watcher? You notice that it activates whenever it is Special Summoned, not just when it is Summoned from the hand by its own effect. I am going to work a self-bounce effect into the activation of another Spell/Trap, and hit it a little anyway. Do you think making its Summon from the hand an effect would bring it down just enough? Heh, I really went to town on this one, obviously. Which one do you think would be the best one to remove? Considering removing the LP gain, but don't know if that's enough. Ah, I see what you mean. I'll remove the Graveyard adding then, leaving it to the Spell/Trap cards. Just before I change anything, I was drawing from Dark Contract with the Witch. Dunno if the genericness does make it too strong anyway. 800? Burn effect. Completely missed opportunity. Not going to insert an effect, but adjust one. Easier to Summon? Removing the protection by battle, but I still feel it is at least a little less generic than Beelze. Was hoping to not put HOPT on any float effect. Would removing the Foolish nerf it just enough? No, that was not intentional. RIP. I was thinking it would be more powerful as it gives more field presence. But then again, this card does have a cost, so I'll probably add that to Bahou and Krell. During either player's turn sounds fine. Gonna throw in some restriction to Fusions and Wingkeepers then. Good stuff. Thanks a ton for the review! Updated all of the monsters and Arson. Only changed the text beneath though, as that was all that needed changing. If any more changes come up I'll redo the images.